Help us decide the People’s Choice Slipper award! To vote just “Like” your favorite slipper on the Gleeson Library | Geschke Center’s Facebook page in the People’s Choice Slipper contest Album by noon next Friday 9/28/12. The prize will be a new iPod Nano. The Library is Open all Night five days a week. So study in the wee hours of the morning and “Like” your favorite slippers on the Library’s Facebook page. My exhibit of postal librariana titled "America's Public Libraries and Their Forerunners 1731 to 1956" includes a section on membership libraries. It begins with artifacts related to Benjamin Franklin's Library Company of Philadelphia which was established in 1731. The Peterborough Town Library in New Hampshire, the first public library in the U.S. was established in 1833 and the Boston Public Library, the first large municipal public library, was established in 1854. Even as free public libraries began to replace fee based membership and subscription libraries there were still membership libraries that were being established. 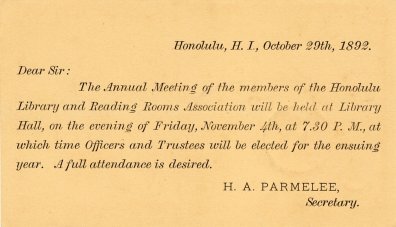 One of these was the Honolulu Library and Reading Room Association (HLRRA) which was established in 1879 when Hawaii was still a country ruled by a king. 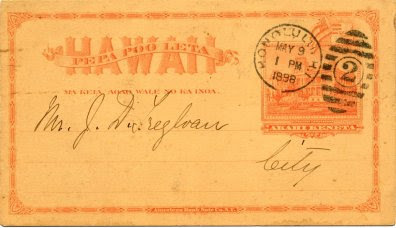 Hawaii also had its own postal system, and in my collection of postal librariana I have two postal cards that were issued by Hawaii that were mailed by the HLRRA. 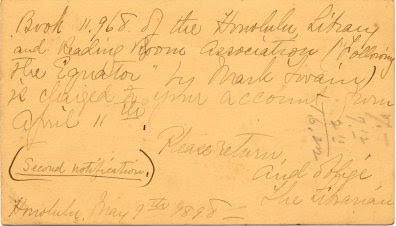 One is an 1892 printed notice of the annual membership meeting sent by H. A. Parmelee, the Secretary of the HLRRA and a founding member, and the other is an 1898 hand written second overdue book notice from the librarian. 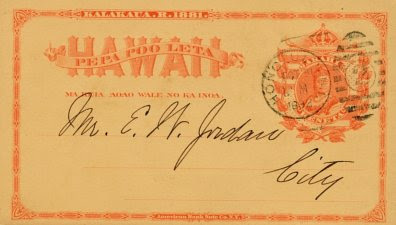 The library component of the HLRRA became a free public library in 1903 when the Territorial Government appropriated $10,000 annually for its support (Hawaii became a Territory of the U.S. in 1900). The Association component of the HLRRA continued as a fundraising and support organization and eventually became the Friends of the Library of Hawaii. Hawaii received a $100,000 grant from Andrew Carnegie in 1909 for a library building which opened as the Hawaii State Library in 1913. I found two online resources on the history of the HLRRA. One is the website of the Friends of the Library of Hawaii and the other is a library school class paper by Avis Poai at the University of Hawaii Manoa. Incidentally, if you are in the Milwaukee area this weekend you can see my postal librariana exhibit on display at the Milwaukee Stamp Show. The U.S. Constitution is the oldest and shortest of all the written national constitutions in the world. More than 11,000 amendments that have been introduced in Congress, but only 33 have gone to the states to be ratified, and only 27 have received the necessary approval from the states to actually become amendments to the Constitution. Of the 27 amendments that have been approved, only one has ever been repealed — the Eighteenth Amendment (Prohibition). For more information about the U.S. Constitution and Constitution Day, see Gleeson Library’s online guide or contact Carol Spector, the library’s Government Information Librarian. Images of children using bookmobiles are among the most endearing portrayals of public library service. An especially appealing image (shown above) is included in a publication titled The Library of the Open Road by Ralph A. Felton and Marjorie Beal published by the New York State College of Agriculture at Cornell University in November, 1929. It shows children using the Monroe County (NY) Traveling Library. The publication is Cornell Extension Bulletin number 188 and it makes the case for establishing county libraries in New York. 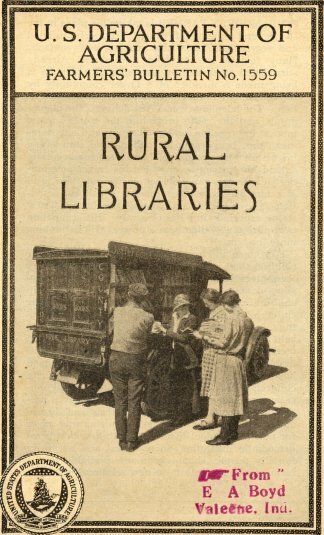 The image of the Monroe County Traveling Library also appears in an article titled "The County Library" in the January, 1926 issue of The American City Magazine. 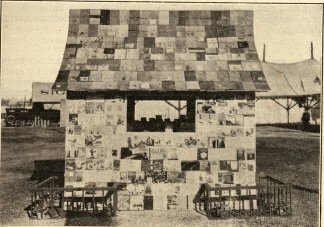 I also found a 1923 newspaper article about the Monroe County Traveling Library which includes the same image. 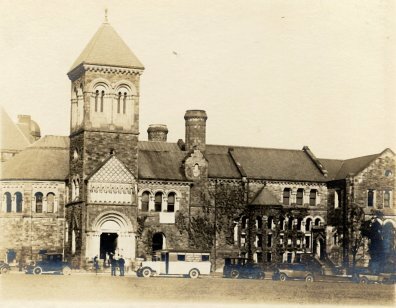 The newspaper article which appeared in The Monroe County Mail stipulates that the Monroe County service is the first of its kind in New York. The headline reads: "Only County in the State Which Provides Free Books for Residents of the Smaller Villages and Farm Districts and Delivers Them From a Real Library on Wheels Right at Their Homes - As Many as 200 Books Loaned Daily". The article makes very positive comments about Miss Ruth Drake, the librarian of the Traveling Library, who was interviewed for the article. She is probably the woman in the doorway of the Traveling Library image. 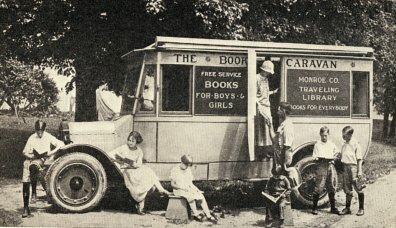 I also have a postcard (see below) showing a later bookmobile used by the Monroe County Library in New York. The extension of public library service to rural areas in the United States has been a goal of state governments for more than twelve decades (the Massachusetts Free Public Library Commission was established in 1890). The passage of the federal Library Services Act in 1956 was a major impetus to achieving this goal and in many states 100 percent of the state's residents have access to public library service. I have several items in my collection that document the efforts to extend public library service to rural areas in the 1920s. One of those is a U.S. Department of Agriculture Farmers Bulletin issued in April, 1928. The conclusion of the bulletin states: "The purpose of this bulletin will be accomplished if rural people, State legislatures, local officials, and library agencies, in view of demonstrated accomplishments, cooperate to make rural library service, as compared with other forms of public service, equal, efficient, and complete." The bulletin has been digitized and is available through the Hathi Trust. 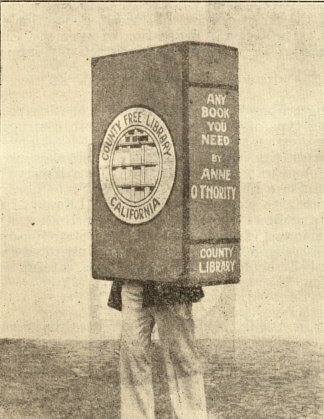 Of the many illustrations related to rural library service and its promotion in the bulletin, I was most taken with an image of a participant in a parade dressed as a book promoting county libraries in California and an image of a small building at a county fair papered in book jackets promoting county library service. Personal editorial: Even with decades of effort there are still millions of people in rural areas in the U.S. without access to free public library service. I think this is a national travesty. Why is it that the library profession can be so passionate about the censoring of a single book and yet tolerates a situation in which so many people have no free access to books and other materials in a public library.